The Sonata Transform boasts of dynamic style, power packed performance, elegant interiors along with the Hyundai badge of reliability and value. The Sonata Transform is powered by the advanced second generation Theta family of gasoline engine which produces a generous 175PS@6000 rpm of maximum power and a peak torque of 23.8Kgm @4000 rpm resulting in robust acceleration and a quick throttle response. The 2.4 litre, four cylinder, DOHC engine is assisted by a Variable Intake System (VIS) and VTVT technology which makes it highly fuel efficient as well as a refined unit. The engine is mated to a 5-speed manual transmission. The diesel variant powered by a 4-cylinder, 2-litre Common Rail engine (CRDi) with a Variable Geometry Turbocharger (VGT) is both frugal as well as an efficient performer. With a peak power of 150PS@3850 rpm and max torque of 32.1kgm@2000 rpm it generates enough performance to delight the enthusiast. 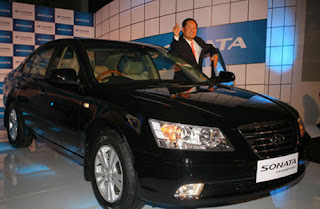 The diesel (CRDi) variant will be available with both - a 6-speed manual and a 4-speed (H-Matic) automatic transmission.